The first meaty plum tomatoes in my kitchen garden are finally starting to ripen, and there's homemade pesto in the fridge. It's time to make a Savory Tomato and Basil Pesto Pie! This is one of my most popular recipes, and for some reason men seem to especially love it. The other day my friend Susan in Vermont said, "I'm making your tomato pesto pie for dinner tonight. I made it last week, and my husband fell in love with me all over again." Do tomatoes and basil say summer to you? 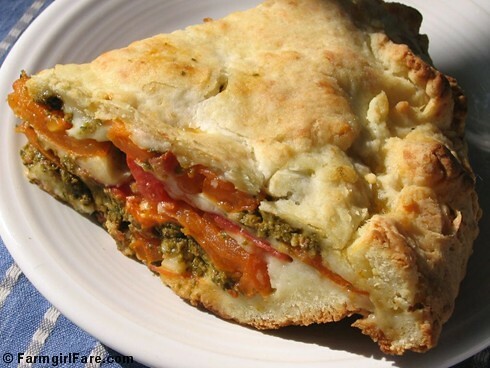 Do you love pesto and savory pies and melted mozzarella cheese? Then you'll want to celebrate the bounty of summer with this scrumptious Savory Tomato and Basil Pesto Pie. Don't believe me? Click here for a sampling of rave reviews from Farmgirl Fare readers. (Thanks so much to all of you who take the time to come back and report on my recipes!) Ready to eat? You'll find the recipe here. Hungry for more than pie? There are links to all my sweet and savory Less Fuss, More Flavor recipes in the Farmgirl Fare Recipe Index. © FarmgirlFare.com, the ripe and ready foodie farm blog where I haven't forgotten that promised post on growing arugula in hot weather. The short version? Order a packet of Rucola Selvatica arugula seeds from Pinetree Garden Seeds in Maine and scatter them in a partly shaded spot in your garden ($1.35 for 400 seeds). It looks delicious and easy to make. My plum tomatoes are just starting to ripen as well. Have a good weekend. Diane. Oh, my! That looks incredibly GOOD!